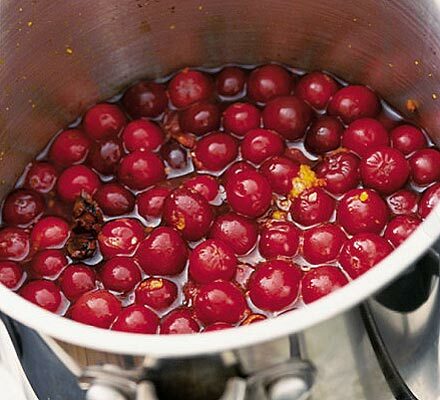 Yesterday I mentioned I would post my Cranberry Sauce recipe for anyone looking for a zesty, tasty alternative to that stuff that comes out of jars (blech). I’ve been making this sauce for 18 years, and even people who eschew cranberry sauce like it. It was originally a Bon Appetit recipe, but I’ve made enough changes to it over the years that I consider it my own now. Not only does this work well with turkey–but you can use it to perk up chicken and pork roast. Combine the berries and wine in a heavy saucepan over medium heat. Cook until berries burst, stirring often (about 5-10 min.). Add sugar, salt and spices and stir for a minute. Combine cornstarch with orange juice and lemon juice and whisk until smooth. Slowly stir into sauce. Add orange peel. Simmer until thickened (about another 5 min.). Taste and add more sugar, if desired. You can make this up to 3 days ahead of the meal. Makes about 1-1/2 to almost 2 c. Serve at room temp.